I appreciate your support bud...Thank you..! "Please add me to your Country Club"
My name is Neil and my username is nkinsella. I have put in a request to join your club and would be gratful if you would accept. 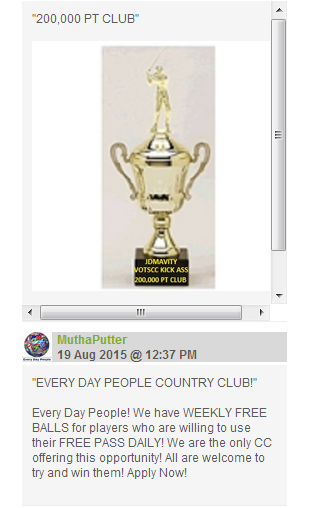 I have read about the club on the WGT forum and am excited by it. If you add me I promise to enter lots of the CC events, Use my pass each day to the benefit of the CC and be friendly with you and all other members of the club and play the game in a good spirit. Paul...thx for the invite....I wasn't looking for a CC, but have a couple of close friends in the one I just joined...it's a very small CC and thought I would give it a shot. I only ever play Alt shot anymore, maybe the odd MP game...many of the larger CCs are competitive in tourneys, clashes etc....not my thing really...just enjoy the social aspect with friends. p.s. Love the CGI bro. very stylish! Lol whatever . Not interested in your CC . Don't care if you poach . Our members are free to do as they choose . We are a very strong CC . Don't think anyone is going anywhere . Ok I will do that . posted a loyal, and courageous, defense of you in the wgt forum. We have both seen people eaten alive in there for far less, yet she bravely stood up. On behalf of her, and the many fine members in your CC, don't let the fact that you believe Andyson publically embarrassed you, todefine you or your CC. You have to remain the leader and simply fix anything that needs fixing. I apologize if I seem curt, but loyalty like Kelly showed is very rare, and that quality must be nurtured and earned every day. Her post said far more about you as the owner, that Andyson ever could with his stats and examples. I'm working on a how-to video.....will keep you informed! There's a reason why I reduced from 250 to 204 and not more. Those inactive players don't hurt us but they may be helpful nonetheless. Hi..was thinking about joining a new club,, if you'd consider have me please let me know. Thanks,,Mike. Concerning Altheimers/memory stuff. The best thing to combat this is Coconut Oil - the only thing to loosen the fat in the brain. Nothing else works. Does taste a bit sickly but can be mixed-in with other food like mashed potatoes or whatever. It will raise your cholesterol though , so there is a trade-off. But seriously , get into a routine of a teaspoon-full of oil every day - and see how you get on. "Your the best - I'm the worst!" Hello fine Sir. I am attempting to invite you to play, but no response. Your probably busy, but lets hook up later sir. By the sounds of it, you are a much better player than me, so it shouldn't be too hard for you to give me an old fashion spanking. "Just had an Alt game ...."
With Cindy (sewbug)...a good player and a good sport. Very enjoyable match. She's definitely a "keeper" for your CC..
"My post CC corner "
Sorry if i offended you. i was not trying to do that at all. you said to MP that CC members call what he was doing was poaching, everyone should be able to come and go as they please, but not to have CC owner to down each other, but at least play an get along with each other .not saying you have to like each other but have some respect for one another . and again was not trying to say anyone was doing wrong. "THANK YOU FOR THE KIND WORDS"
TY YOU FOR YOUR KIND POST AT MY CLUB GOOD LUCK WITH YOUR JOURNEY. WGT IS VERY NASTY CALL ME ANYTIME 859-694-4176 IVE HELPED CLUBS MOVE ON AND IVE BROUGHT THE ENTIRE CLUB HERE, I LIKE YOUR TECH, LITTLEJOHN61, CLUB OWNER. PDB1. Forget what I said about CT. I think we are on the verg of working out all our differences. Turns out he is not that bad of a guy after all. See you later. "You are my friend sir!" PDB1. I am sorry for the post that someone posted as a quote coming from me. That post was deleted immediately by me because I thought I was posting about CT. I didn't mean it against you. In its place I said something to the effect that "you are my friend". I would never say anything against any of my friends. I also TRY try try not to say anything bad about anyone, however it is getting extremely difficult not to lash back at CT. He has been all over me for years. I don't know what his problem is. I truly believe he needs psychiatric help. There is something wrong with that boy! Anyways, what can I do to make it up to you? Henry (I am a police officer - 36 years and still not retiring). I actually posted on Gary's wall that his comments about you instilling hate were misplaced...you can read it unless he deleted. Kawa is an idiot...a narcissistic psychopath who craves attention ...akin to a reality star without a career. Its always a pleasure to play a nice club .We will look forward for another matchup . No need to stay off the thread my friend. When someone ruffles your feathers then let them have it. I am at the point in my life where I take no S-it from anyone. The thread has gone all over the place and so be it. I made a comment awhile back saying that many of the binge posters on WGT have never commented on this thread. No names but I'm sure you have some ideas of whom I'm referring. Get back on and let it fly. why people feel the urge to pop out of the woodwork to take unprovoked shots at us?...the latest is FatDan...but he sure wasn't the first. I've seen people have complete melt downs in the forum...use every curse word known in the English language and Cap Bold all of them...and never a thing said about it. I just don't get it. Forgive me for not getting emails or your messages. I play on my iPad so I don't see wall posts from the app and for some reason I'm not receiving email notifications. I will attempt to complete the remaining requirements tomorrow. I also need to get better associated with sending messages. Not sure what happened at the end Paul, sank that putt and was kicked off. Good game. 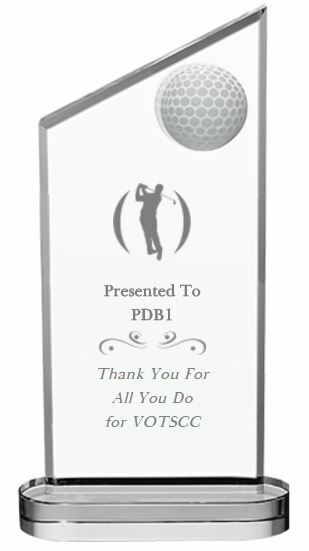 Good to see some players out there with respect for the game..have fun out there. That's so nice, thank you so much….Wish we could have given you more of a challenge! Good luck to you as well! Happy egg hunting Paul..hope you and the family and VOTSCC have great weekend! Thank you for standing up to the lame weak minded bullies in the forum. Believe me when I say that you have many more supporters than they do. The bullies must believe that if they constantly spew their rubbish in the form of criticism, that it will actually become true. The truth is that nobody offers a single bit of tribute to them or their vicious criticism of so many others. You have posted several times about the pending ruination of your CC. I have never seen an owner publically bemoan hisown Club and slag its' members for continued lack of participation.Then you state concern these same people may read my post? Your posts and responses are becoming stranger and more disconnected from reality. If a mountain of evidence says an object is blue, you will state it is white and challenge people to prove you wrong. Paul...sometimes a cigar..
WHO IS RIGHT AND WHO IS WRONG in this dispute of words? I think very highly of you sir, and would not do anything to jeopardize that, so I am going to be honest and tell you who is "RIGHT", between you and CT.
You are! Although ct is trying to be fair, his skepticism and un-trusting character has made all his allegations, when it comes to me, off base and wrong. Thank you for the support. Some day I will verify (to you), that I am who I am claiming to be. "Thank you again my friend!" - Don't worry, I will be back. This is just an intermission. I am JUST GETTING WARMED UP! 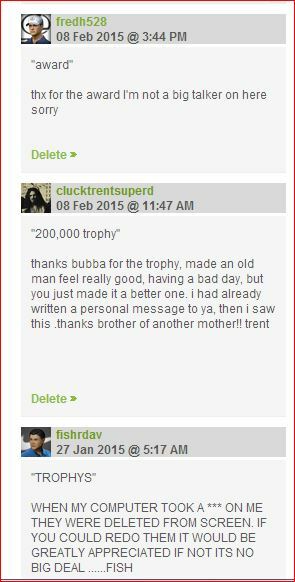 On February 14, 2016, you made me a trophy in recognition of my 3000 friends. I thank you very much for that. A new milestone is approaching sir. I am closing in on 4000 friends. I think I will accomplish that goal in about 2 weeks. HK. "You been reading my mail"
"One day we will give you agame"
I'm not to bad just having a bad spell !!! I thought I had left a message about leaving the club.but obviously not.please accept my apologies. but I have left the club. "Got my match in with GMDAVE for the Clash!" Just to keep you posted, I did communicate with my opponent, GMDAVE, and we were scheduled to play this afternoon, after I had to postpone from this morning. However, we haven't hooked up yet, and now at 4:30 CST, I have to leave. I just know I'll figure out a way to play these events successfully at some point. Wanted to keep you informed. Paul, if you have settled down, I will unblock you. thx vm for you words...our position in the clash is always between 48 and 55... in 58 players i think is a very good result...we can't do better at moment... thx and good game. I cannot seem to message you --- could you try on your end to reach me please? YancyCan wrote "Thanks For The YancyCaan Page!" Thanks for not only the nice words - but I love this "YancyCaan" video page on your CC website! Happy you have enjoyed my video work --- MUCH MORE to come! No excuses here, I just didn't pay close enough attention to the event I missed. Will make a concerted effort to not do that again.. In that regard, I need to let you know that I'll be on a trip without access to internet from next Thursday, 6-3, until Saturday, 6-18. So, since I won't be able to respond or stay connected, it's not a slight against you or our great club. I'll be back in full swing on the 19th, and will send you a message. Will be up and playing some WGT golf before then. Thank you for the warm welcome:) I am still kinda new here and figuring things out as I go. Luckily the WGT community is friendly and willing to help. My Wife went to AJ High school and graduated in 1987, I live in east Mesa, Baseline and Power area. Maybe we can do lunch some day. I did make contact with 2511jonnyxx and we will try to hook up tomorrow afternoon my time (he's in UK). Regarding the Interplay#5 and #6, can you tell me after I've reached my opponent and set up a time to play, how do I set up a match for multiple players? I just haven't done this yet. Also, thanks for entering me in these matches! Hi Paul. I do live in Goodyear and that's why I came up with the name. Just typed it in. WGT just let me know it was available. Had I known there was another club by nearly the same name I would of tried something different. Didn't realize it until I had setup the club. As you said nothing we can do about it now since WGT doesn't allow name changes. I'll keep your offer in mind if it doesn't work out. I'm back from our trip and from being away from my PC and VOTSCC. Thanks for your leadership of our club. If you get out this week end i would love to play 1 and shoot the sh...it! Looks like things are going good in the votscc...hope all been well and look forward to seeing you the course bud. hey paul hope your well ? "Will be out of PC touch"
I"m going out of town from this Saturday, July 2nd until Sunday, July 10th. I'll be without my PC, but will have the iPad. I'll respond to any posts when I return. Hope your summer is going well. seems you going the way of over 60 usa players mate . in the bin eg blocked goodbye . Thank you for your kind words. For us here from Walhall it was a pleasure too. All the best for your coming matches! I told to the person whom i handed the club to warn me in case of problems. Didn't think it was that . Don't even remember that . But I can see I was not trying to poach at least . Lol . the post or what I was referring to , must have been a long time ago . But yes It would have been a compliment . You got your memory back, amazing. Congratulations. Notoriety says you, for what? Why did you form that opinion, that I'm 'infamous'? I thought I was just a legend. I expect not to have to remind you of anything. Being " The Dub " . "I guess my definition "
was not the exact proper adjective . Maybe more along the lines of " notoriety " . I deleted my post, so nobody else can see it. You can find it in your email, the link to the CC is in there. "For helping the guys with the cc forum"
Thank you for your wishes. We too enjoyed it ... best of luck. Thanks for your support mate! Your objectivity makes me happy! "Same group of prats ..."
I agree with your post. It's always the same group of posters being negative about EVERYTHING. And most of them break several forum rules/TOS guidelines every day with their trolling. I'm back in Dallas again and will be checking in our forum and playing some rounds. I played some while out of town on the iPad, but it's not the same as being connected to our Club. Hope all is well with you and the Club. You were directed to our club by mkrizan86. Regarding that, everyone is entitled to opinions. FWIW about 40 of our 60 members have joined our FB Group, including 18 of 19 with sub 61.00 averages. Obvious no proof of anything but I think it is a possitive thing. Your club has 21 Master Tier players or greater. Put together a list by July 24th and I will get volunteers based on tees and tier for play in August, if that is truly your intention. Will be joining you before too long. Well done on 11th..maybe we can start a Flamingo Garden...lol..Take Care Brother ! 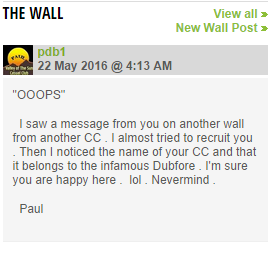 Hi Paul, thanks for inviting me and welcoming me to your CC. Much appreciated. Bit busy over next 2 days but hoping to get my introduction post posted in the forum soon and checking out the website. Man, there's a lot to do. Once I'm up and running I promise I'll become a welcome addition to the club. I will think about joining your C.C. You are one of 2 i am pondering once i leave my present club. After reading your latest post to the 'Andyson' thread, I truly suggest you seek help. Wow, and Wow! To me, it is incomprehensible that anyone with a shred of decency would corrupt an online eulogy to one of our lost members. Maybe this is a mis-understanding, but if not, the cdommunity will not look favorably on your actions. If your forum post about "pot / kettle" was directed at me, you are waaaaay out of line. I have followed almost every forum post since I joined in 2011. I have seen everything that has transpired between you and Andyson in open forums. I simply asked that out of respect, you and Colin take your personal battles elsewhere, as is only right in memory of one who gave so much to our community. There are many who would think that bringing any type of personal disagreements to that particular thread was very inappropriate. I will leave it at that. ...for the quick response. I have always considered you an upstanding guy, else I would pay you no mind. I did apologize in advance if I missed something. We both know life is fleeting...A truism lost on the young.